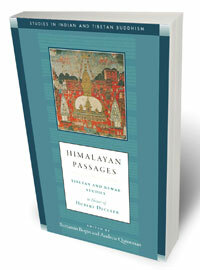 Kathmandu, Nepal -- Himalayan Passages: Tibetan and Newar Studies in Honor of Hubert Decleer (Wisdom Publications), is a fine collection of scholarly, yet accessible, articles that should be on the reading list of anyone with an interest in the history, culture and religious traditions of this region. Hubert Decleer, to whom it pays tribute, is a Belgian native who has made Nepal home since 1980. He is a well-known figure in the Kathmandu Valley, and one of its most renowned scholars and teachers. As the founding director, then senior academic advisor, of the Tibetan Studies program at the School for International Training (SIT), he has been a beloved mentor to an entire generation of students, many of whom attribute their career choices to his benevolent influence. Several participants in his SIT programs went on themselves to become scholars in the field of Asian Studies. Five of these experts contributed essays to this volume, including the editors: Benjamin Bogin, who teaches Asian Studies at Skidmore College, and Andrew Quintman, of Yale University’s Religious Studies department, who is a specialist in the traditions surrounding Milarepa, the Himalayan Buddhist saint. The book grew out of the papers presented by a panel of Decleer’s former students at the 2010 meeting of the International Association of Tibetan Studies. In addition to their essays, it contains contributions from senior specialists in the various branches of Himalayan studies, including such notable figures as Ernst Steinkellner, Leonard van der Kuijp, Donald Lopez, Alexander von Rospatt, Anne Vergati, and Nepal’s own Punya Prasad Parajuli. They cover an impressive range of topics in their articles, including religious and social history, sacred geography, art history, textual interpretation, and ritual studies. This is especially fitting in a tribute to Decleer, as they reflect the diverse areas in which he has done pioneering research. With a biography that includes time spent as a musician, artist, linguist and textual scholar, he has an expansive range of interests. The articles are grouped under four overarching themes: Places and Pilgrimages, Texts and Manuscripts, Ritual and Visual Traditions, and Histories and Transmissions. While each of the 14 contributions represents first-rate scholarship, it is worth drawing attention to some of the essays, including those that might be of particular interest to local readers. In 'Places and Pilgrimage', an example would be Alexander von Rospatt’s piece, ‘The Mural Paintings of the Svayambhupurana at the Shrine of Santipur, and Their Origins with Pratapa Malla’. Andrew Qunitman’s own article deals with the biography of Milarepa and his association with sacred sites in Nepal. In the same section is Donald Lopez’s article, which looks at the encounter between Mahayana and Theravada Buddhism in the form of a visit to Sri Lanka by Gendun Chopel, an interesting and somewhat controversial Tibetan figure in the first part of the 20th century. 'Texts and Manuscripts' includes contributions by two of Decleer’s more renowned colleagues, Leonard van der Kuijp and Ernst Steinkellner. The essay in this section that might intrigue general readers most, however, is Sarah Jacoby’s. ‘The Excellent Path of Devotion: An Annotated Translation of Sera Khandro’s Short Autobiography’ looks at the memoirs of Sera Khandro, a woman who, in the rather patriarchal world of early 20th century Tibet, became a famous writer, teacher and visionary. In the Ritual and Visual Traditions section Swayambhu and King Pratapa Malla get a second treatment in an article by Anne Vergati, the well-known art historian. She presents a very interesting exploration of the depiction of the famous stupa in a 17th century Newar paubha, or scroll painting, that British Resident Brian Hodgson acquired in the mid-nineteenth century, which is now housed at the Musée Guimet in Paris. The fourth group of essays is 'Histories and Transmissions'. The essay likely to be of most interest to a local audience is Punya Prasad Parajuli’s ‘Vanaratna and His Activities in Fifteenth-Century Nepal’. Collating data from three traditional biographies of this famous Vajrayana monk and teacher from Bengal, Parajuli presents a summary account of the mahapandita’s life with, as the title indicates, a focus on his experiences in Nepal. Though an important scholarly work, this book will make good reading for a broad audience of those interested in Buddhist traditions and the culture of the Himalaya.